I love this container! It has the best self-sealing system I have come across. It works literally at the push of a button. One push to seal and another to release the vacuum before opening the container. The hard plastic materials look like they can take a knock and will last well if not smashed to smithereens, although they might show scratches. It can go in the fridge but is not suitable for very hot liquids and nowhere does it say that it is safe for the freezer. Personally, I would not chance it. It is easily washable and, therefore, hygienic. The instructions that came with my sample say to wash it by hand only, NOT in the dishwasher, although the product page contradicts this. I will seek clarification. It comes in three very useful sizes and the squared-off shape is both balanced and easy to store. I only have one (for the moment!) but the box suggests that they are stackable. 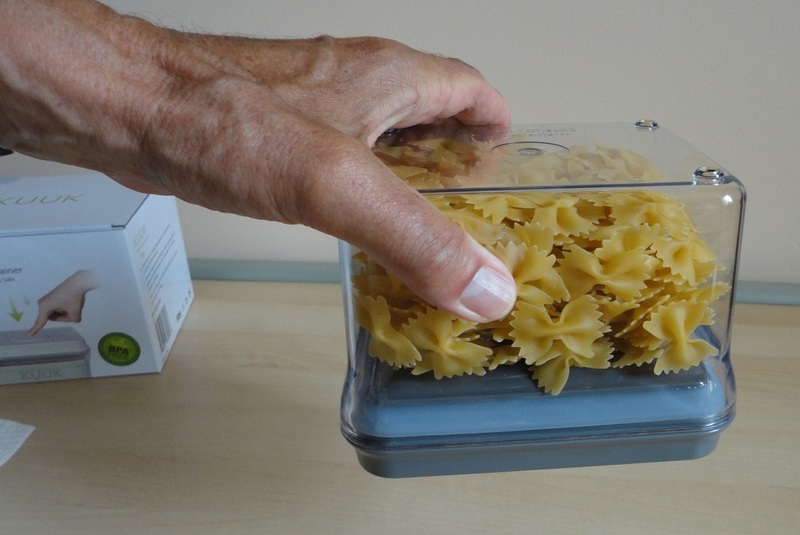 Ideal to keep the contents of opened packages fresh and organized: pasta, coffee, sugar, flour, cereal, biscuits, cake, herbs, spices, nuts, beans; but also cheese, left-overs, salad ingredients and just about any type of food that should be kept sealed, protected from air and contained. Of course, it can be used to store things other than food, and the clear, see-through sides make it ideal for many purposes. 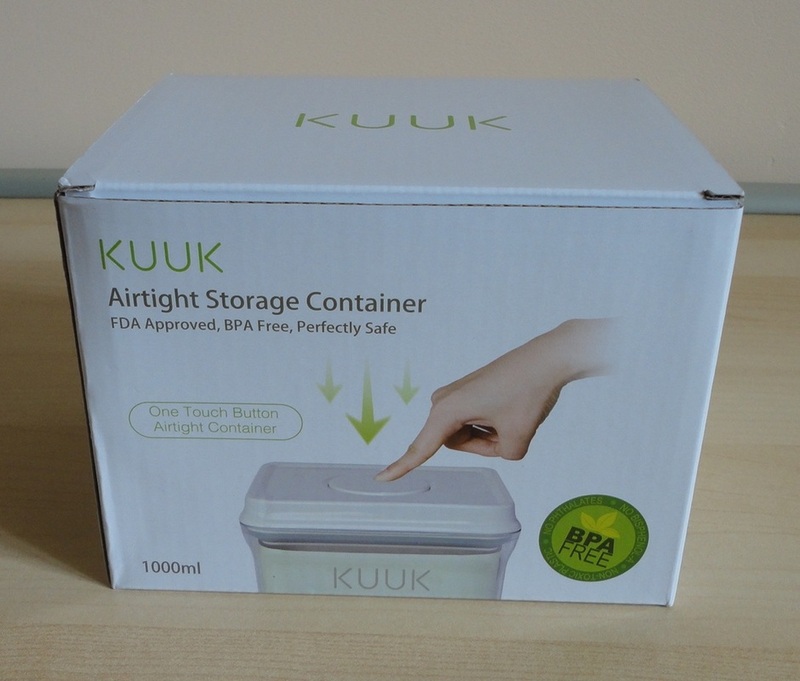 Kuuk have come out with some of the best kitchen tools I have seen in a long time. All manually-operated, easy to use, a breeze to wash, and cheerfully sporting a fresh green and white colour combo, so your kitchen can look smart and co-ordinated while you are being terribly efficient. 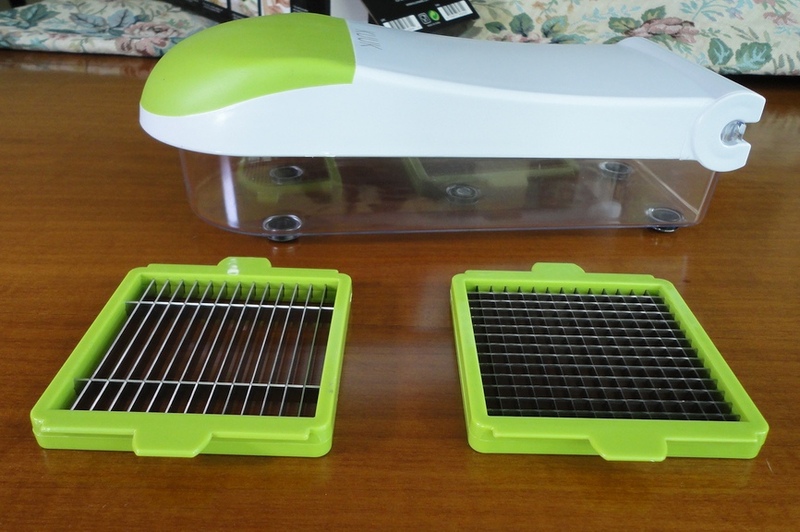 This rotary food grater, which I received for testing and review purposes, reminds me of the first food mills in its action and results, but the hard plastic body and ingenious vacuum base are definite improvements. With a choice of two drums (with larger and smaller holes), a lot of different foods can be grated to perfection, and you will soon find your favourite combination of drum and food. I find the finer drum ideal for hard cheese, ginger, nuts and chocolate. Most vegetables lend themselves to the coarser treatment: zucchini, sweet potatoes, carrots, onions and so on. I also like the coarse drum for tofu, apples and medium-soft cheeses. 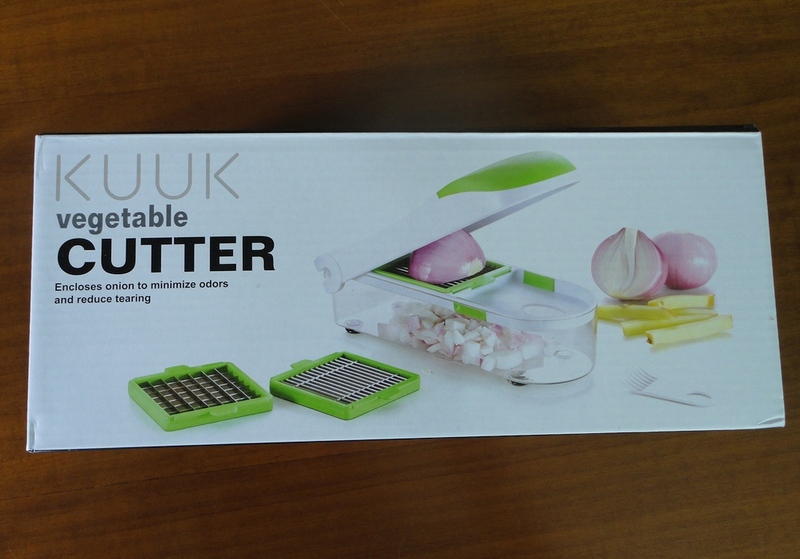 This grater is fabulous to speed up preparation of large amounts of food, but don't discount its usefulness even if you are only cooking for two. Because washing the few parts is so fast, it is hardly any more bother than washing two or three different knives. 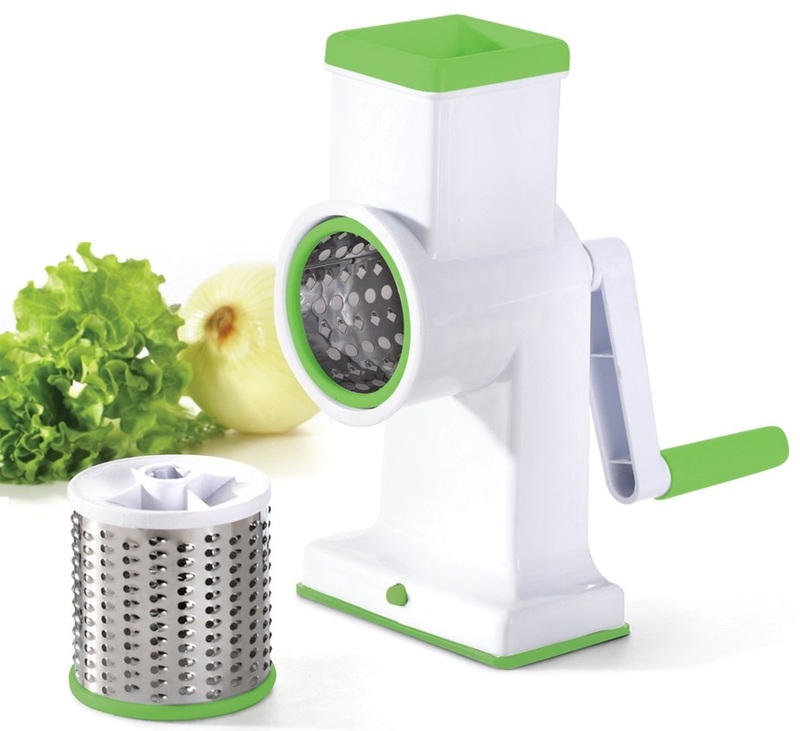 As far as operational safety, it certainly beats the old hand-held grater which used to take chunks out of my fingers. A lovely and efficient kitchen helper that I find myself using more and more. 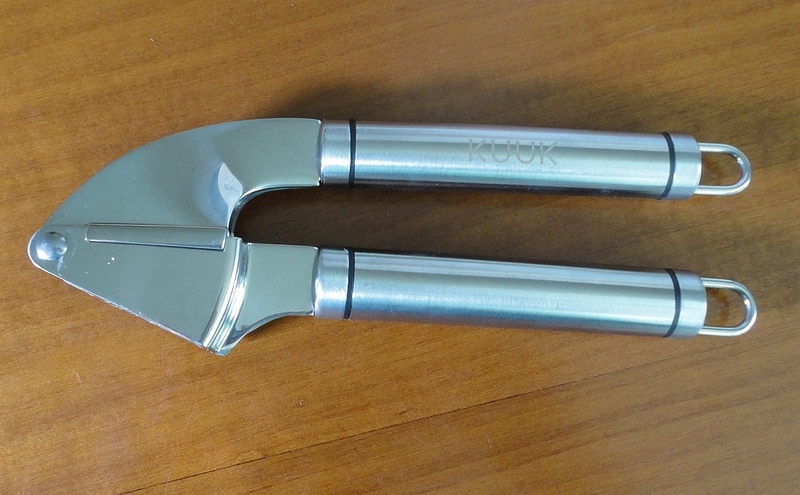 I love the sleek and minimalistic look of this excellent garlic press, which I received last week for review purposes. I appreciate beautiful objects, and this gadget pleases my eye. Entirely made of stainless steel (shiny at the working end, and with a brushed finish over the handles) this capable kitchen helper has a nice heft and feels very durable. My last garlic press was made of a composite metal alloy that looked and felt cheap, so there is a massive difference. Apart from its striking good looks, this is a serious precision instrument which makes garlic preparation a pleasure. You can pop a clove in the basket with the skin on and easily press the flesh and juice out of the bottom holes. I love the aroma of garlic in my food, but a bit less on my hands, so I appreciate the minimal handling. Another clever feature is that the basket swings out of the bottom section. I'm not sure why but it seems to make the squeezing action much more powerful and, of course, cleaning is a breeze. I find the grip particularly pleasant. I must admit that I have shamelessly shown off my new garlic press to universal admiration from friends and family. I have a feeling that this one is going to be a long-lasting tool even with the regular, daily use it gets in my house. The manufacturers are clearly confident because they offer a lifetime guarantee. A crisp combination of kelly green and white for this innovative salad spinner, offered to me for evaluation and gratefully accepted as my latest one had just lost its grip. If you want the short verdict, this is a really well-designed, sturdy and effective gadget. 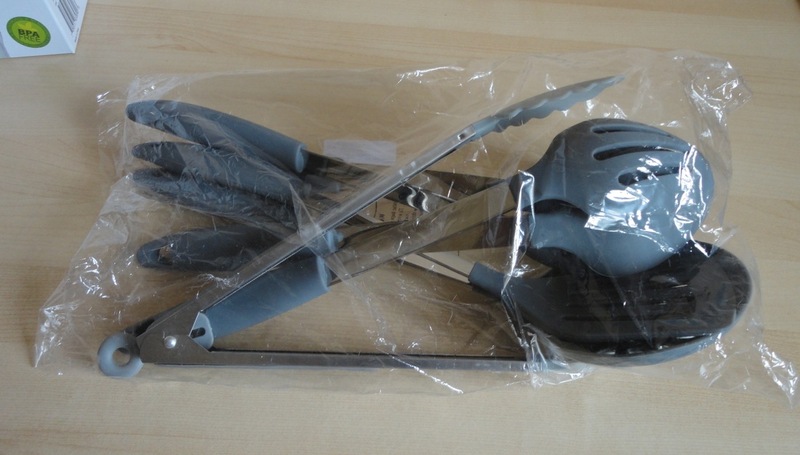 At the current price of just under £15 (or US $13), it represents great value for money because I believe it will last much longer than is usual for such utensils. How much innovation can one find in such a simple kitchen staple? Well, as it turns out, this model has quite a few features I have My previous salad spinners all seemed to be made of the same coloured plastic. This one has a completely clear bowl, which lets me see the water inside and facilitates washing. 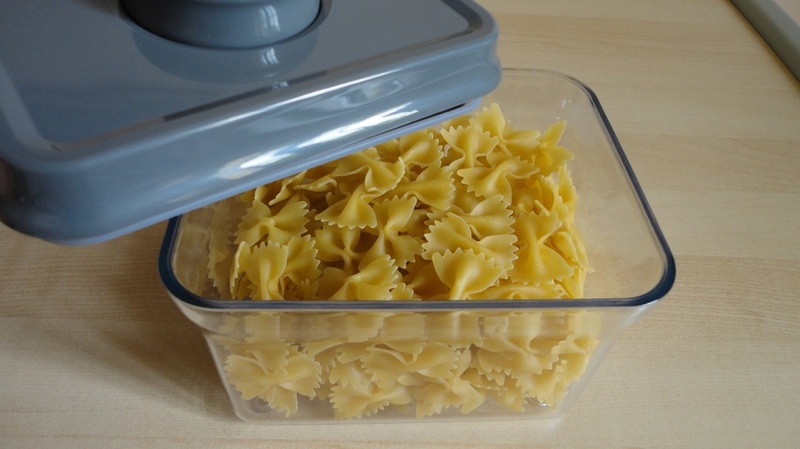 The empty bowl can also be used to store any left-over ingredients, open or sealed with plastic wrap. not come across before, and the mix of different plastic materials makes it stand out from the rest. The basket is made of white plastic with a tight pattern of slots which effectively holds the smallest and tenderest pieces of lettuce while allowing water through. Because it is made of softer plastic, it is less likely to become brittle and break. But the stroke of genius is in the lid which is smartly designed to cut down on handling wear and tear, and so extend its life span. Invariably, the weak point of such gadgets is the small “teeth” that engage the basket and make it spin. When we want to stop the spinning to drain away the water, we have to apply abrupt pressure and sooner or later the little plastic tabs snap off. This lid has a simple locking tab and a sturdy handle with a knob which rotates freely on its base, allowing me to keep control over the speed and intensity of the movement, so I never stop it abruptly. Secondly, holes are provided to both fill and drain the bowl; typically I would remove the lid four or five times to drain water away before my lettuce is acceptably dry. As I can pour the water through the holes, I only remove this lid once. Thirdly, this spinner has a handle and small anti-slip pads under the base, both helping to improve stability and control on my part. And, finally, the gear mechanism that multiplies the manual turns and causes the basket to spin at high velocity is very powerful and water is ejected very quickly. All these little details allow efficient and smooth operation, and I would be very surprised if this spinner failed as quickly as my last one. All the pieces are said to be dishwasher-proof, but I would never risk those crisp good looks by subjecting them to boiling water and abrasive detergent. Anyway, how dirty can a salad spinner get? 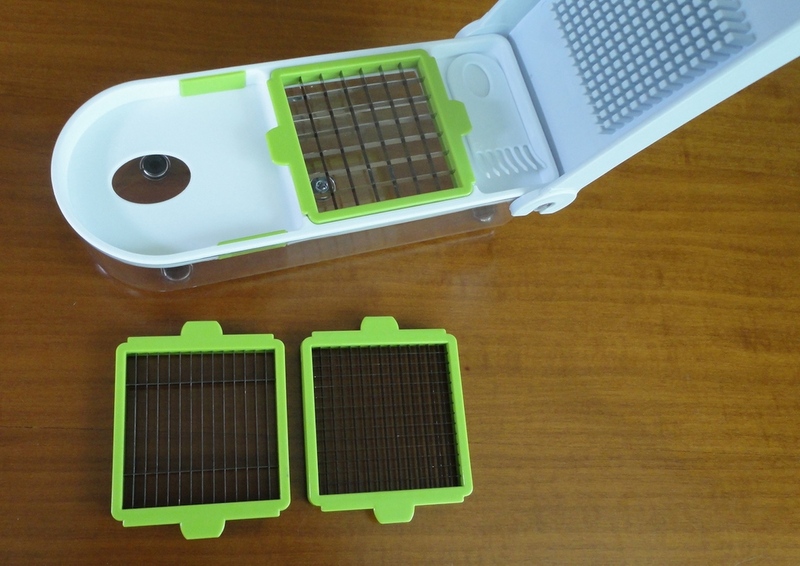 I have used it to wash and dry all kinds of vegetable leaves, but also fruit such as strawberries, grapes and those notoriously messy blackberries. A quick soak in warm, soapy water and a good rinse under the tap seemed to be all that's necessary to remove all food particles. 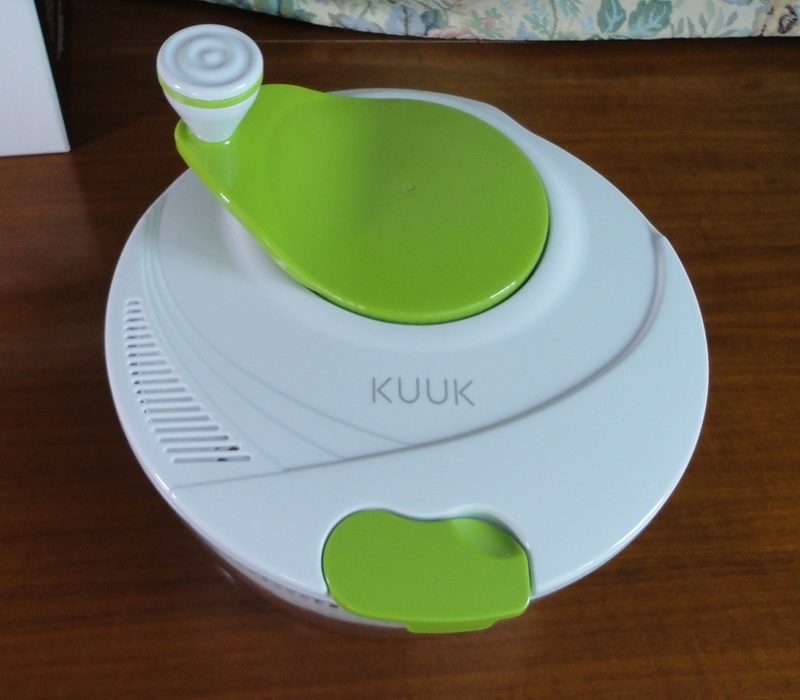 If aesthetics are important to you, you will be delighted to know that there is a full range of Kuuk kitchen implements, all sharing the same beautiful green and white accents, so your kitchen will look tastefully co-ordinated and designer-perfect. These stretchable silicone lids work better than I anticipated. With six in the set, it's easy to find one that is just the perfect size. Their coverage ranges from about 3 to 11 inches. It's even possible to stretch them over a slightly rectangular shape (see my photo). The easiest technique is to secure one edge first and hold it with one hand, while stretching to reach the other side of the container. Also it helps if the container's edge is dry. I already had a similar type of lid but the design was very different. The little tabs on this set really help to keep hold of the side you are stretching and later help finesse the seal. 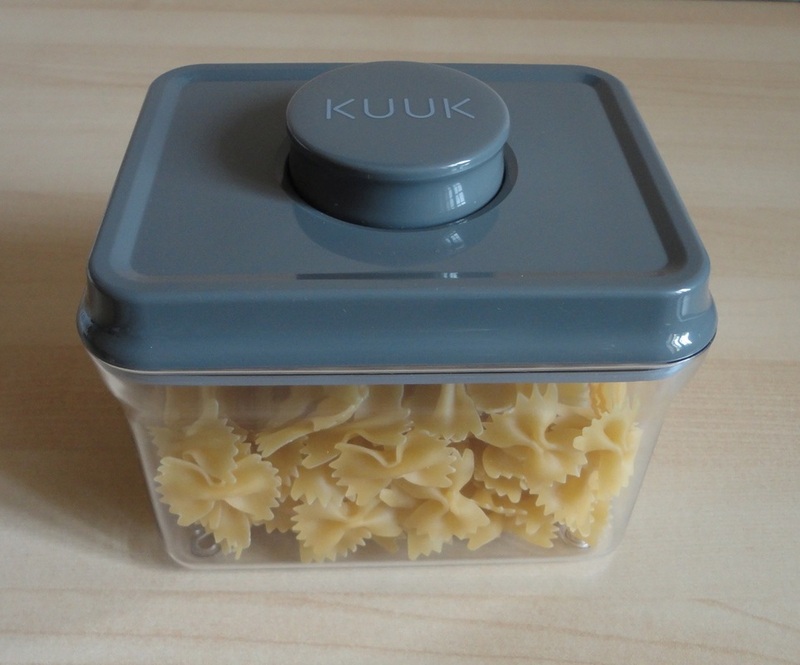 The lids are effective even on containers of identical size, although the seal will not be tight. 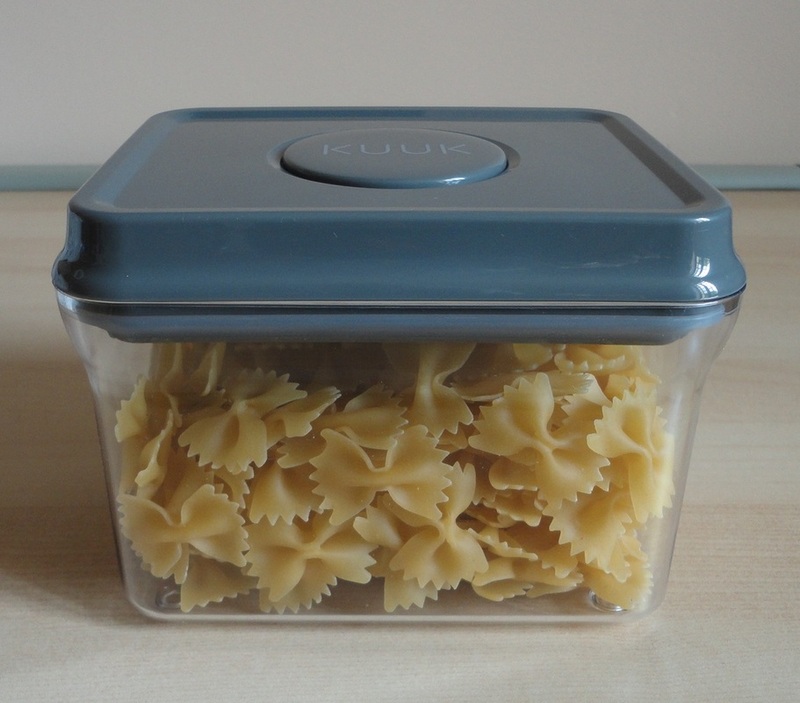 The advantage of these over rigid lids is that the elastic silicone will form a dome if the container is overfull. I hate cling film and seldom use it, so I find these infinitely useful. A really good idea and I love that they are easy to wash. I don't have a dishwashing machine nor a microwave, but they are apparently suitable for both. They also go in the freezer and you can store them nested to save space. Excellent product; we'll just have to see how well they last. We bought a pair of silicone tongs years ago at the local supermarket. 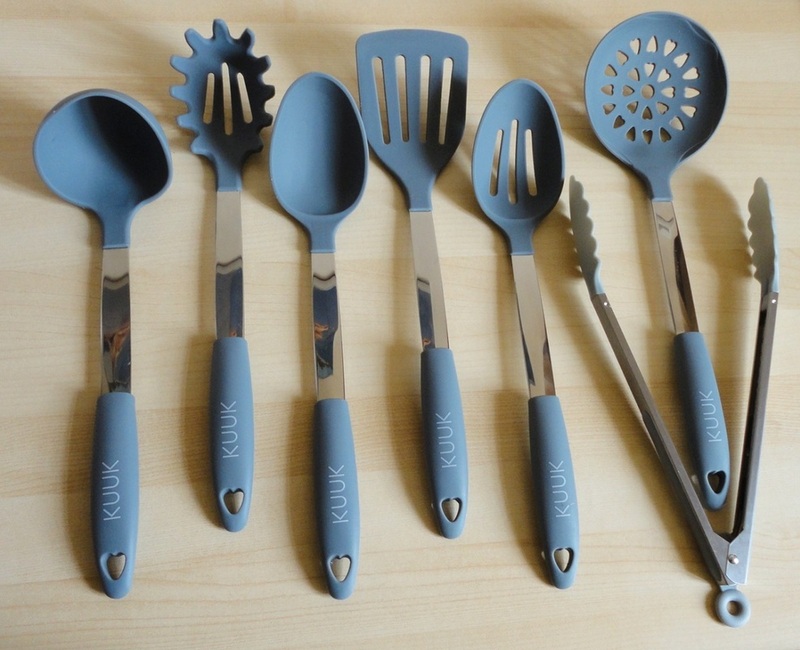 If these kitchen implements from Kuuk are anything like it, they will last for ages. Actually they look of better quality and the handles are wonderful, fat and a bit sticky to give a nice, secure hold. I like that all the handles have a hole if you decide to hang them on a rack. We are gradually replacing metal with silicone in our kitchen, as we use mostly non-stick pans and pots which are easily damaged by metal utensils, however careful one tries to be. Wooden spoons don't scratch but are seldom hygienic. Silicone really is the best material: it's easy to wash, heat-resistant in normal use, food-safe, kind to other surfaces and, I think, good looking. This is a perfect starter set (or replacement set) with everything you need on a daily basis: soup ladle, pasta scoop, sauce spoon, slotted spatula, slotted spoon, perforated skimmer and bonus lightweight tongs. All the utensils are well made and well balanced. I am particularly pleased with the ladle and big spoon (I haven't seen too many made of silicone) and the tongs with their self-locking tab and pointed shape that gets under certain foods much more efficiently than our old flat ones. The packaging (a plain, transparent plastic bag) is not up to the quality of the set. Fine if you buy these for yourself, but not impressive if you decide to give them as a gift. I have a large and diverse collection of kitchen knives which I like to use for ordinary, everyday food preparation, but there are times when hand chopping fruit and vegetables can get to be a real chore. 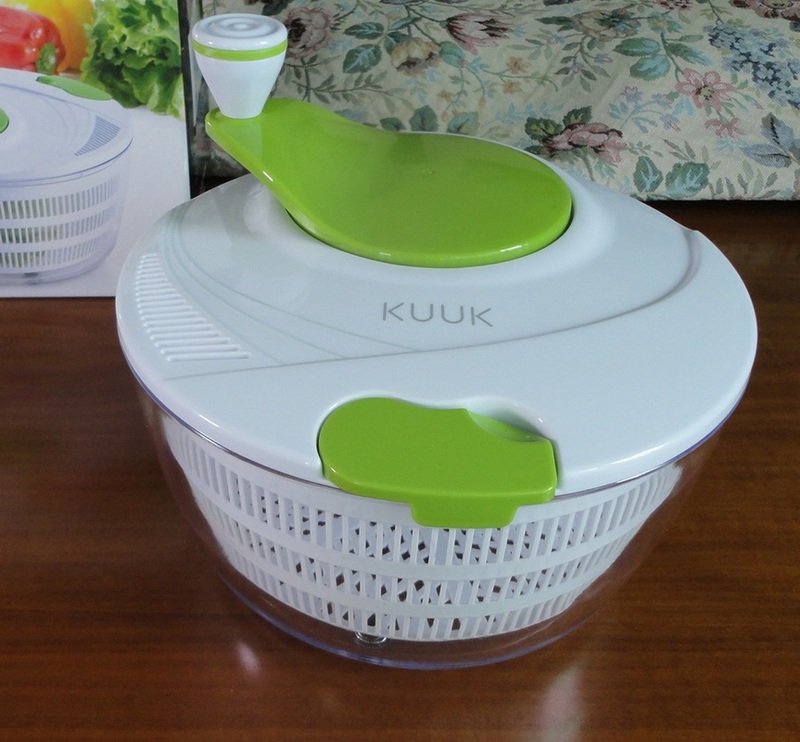 That's when a specialized food chopper like this ingenious Kuuk gadget can make all the difference: for example, when I'm making my infamous Italian minestrone, or when precise slicing is desirable, or when handling slippery, wet foods like cucumbers. Chopping Roma tomatoes for a home-made pasta or pizza sauce is another task that simply cannot be done nearly as quickly and deftly as with this cutter. Hand slicing takes forever and if I try pulsing quickly with my food processor, I end up with a mashed, liquid mess instead of the distinct little squares that the smallest grill can produce in seconds. It comes complete with three grilles with blades set in different patterns, sharp at the top (or cutting) end and duller at the bottom. There is one to make medium-sized slices, one for large cubes and a third one for smaller cubes. Also very useful is a small plastic tool, shaped like a comb, with tines that slide perfectly through the gaps of the top (pressing) part of the chopper. The Kuuk vegetable cutter is a manual device and operation is very simple: just place a suitably sized (3 x 3 inches) piece of vegetable or fruit over the selected cutting grill and press the lid down firmly (I like to use both hands, and exert even pressure over the length of the lid, which keeps the whole thing more stable). As the top comes down, it presses the food over the blades which slice it, and the cut pieces drop down into the bottom portion of the implement, which is made of clear plastic to let you see your handiwork. Changing blades is as easy as lifting one out and replacing it with another. No need to wash anything, unless the ingredients are not meant to mix. When you are finished, the cutter comes apart in several small pieces that can be washed easily in hot, soapy water. Cleaning the bladed grills and the inner lid is sometimes a little time-consuming and might require some help from an old toothbrush, although the little comb accessory really does a great job of dislodging the greatest part of the debris. Or else, just pop everything in the dishwasher. Hard cheese, fruit and most vegetables are candidates for this chopping treatment, but I have found that some can be too stringy. Mushrooms, which I like to wash in lieu of peeling them, seem to become too soft to cut, eggplant skin is too tough and I've found that zucchini work best if I place the pieces skin side down. In general, the crisper the veggie, the better it works. Really ideal for onions because the closed design means you don't have to come into contact with the irritating juice. An ingenious little kitchen helper which I was very happy to receive for testing purposes.